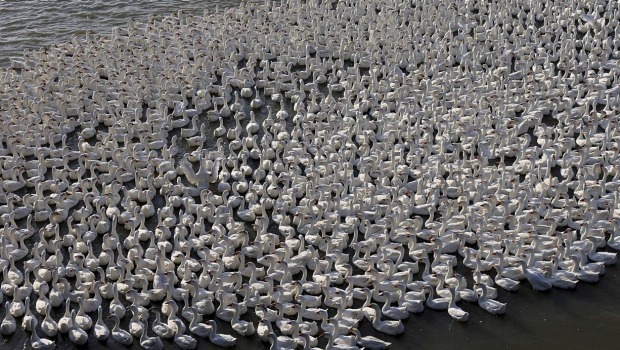 Several thousand snow geese have died after a snowstorm forced large flocks to take refuge in the acidic, metal-laden waters of an old open pit mine in Montana. Mark Thompson, environmental affairs manager for mine company Montana Resources, said witnesses described the pit as like “700 acres of white birds” on 28 November. Despite best efforts to scare more than 10,000 snow geese out of the Berkeley Pit, Montana Resources officials estimate thousands of the birds died from exposure to the toxic mine waste water. "The feeling of helplessness, we couldn't help every single bird," said Mark Thompson of Montana Resources. The news of large die-off has been difficult for crews who have been working hard since last week after the migrating geese landed in the pit on Nov. 28th. "They worked very, very hard to save as many birds as possible, they really put their hearts and soul into that effort and if it wasn't for their diligence and dedication this situation would be even worse," Thompson said. At the Butte animal shelter has a snow goose that was found ill outside of the Berkeley Pit Tuesday morning by a concerned citizen. A local veterinarian has treated it and, hopefully, the animal is recovering. "We had a vet on standby, Animal Control picked up the bird, took it right to the vet and it received treatment," Thompson said. MR has had a mitigation plan in place for the past two decades to keep waterfowl out of the pit ever since 340 geese died after landing in the pit in 1995. "That plan has been very successful, but it has never had to deal with the enormity of what we saw last Monday night, that is more birds than we see in five years combined," he said. Montana Resources will investigate this incident and update its mitigation plan to keep wildlife out of the pit water.